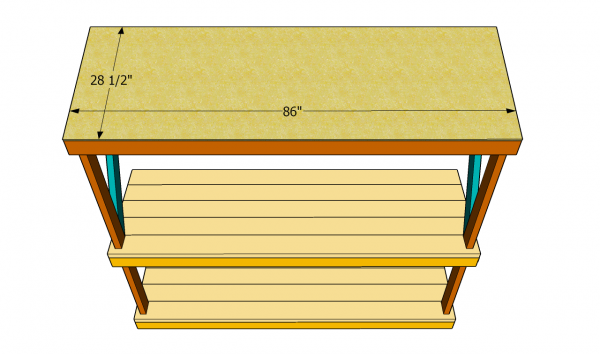 This step by step diy project is about garden work bench plans. 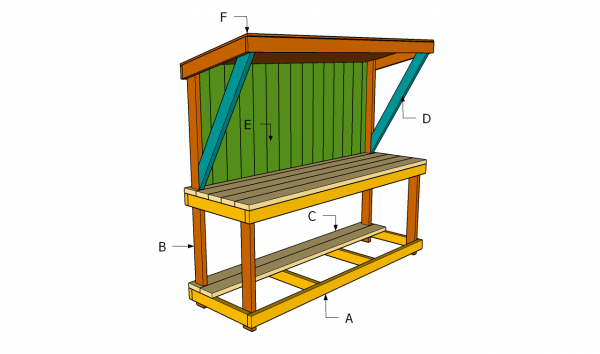 If you need a work bench for your garden projects, you should pay attention to the instructions described in this article. Generally speaking, there are many plans and designs you could choose from, so make sure you look over the alternatives, before taking a decision regarding this woodowrking project. In order to get the job done, we recommend you to buy quality materials. If you have a tight budget you should buy pressure-treated lumber, making sure you choose the components with great care (check if they are straight and in a good condition). 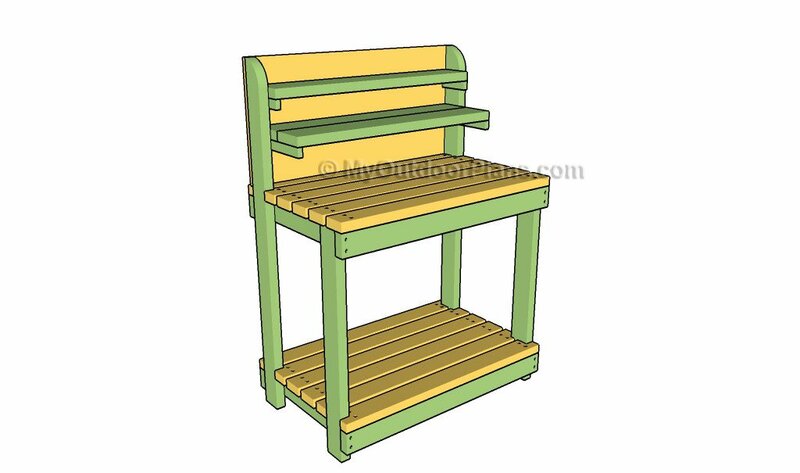 Alternatively, if the appearance of the garden wok bench is important to you, invest in quality lumber, such as redwood, pine or cedar. A garden work bench doesn’t require a significant investment and can be built by any person with basic woodworking skills. In addition, if you use proper tools and materials, you can get the job done in just an afternoon. 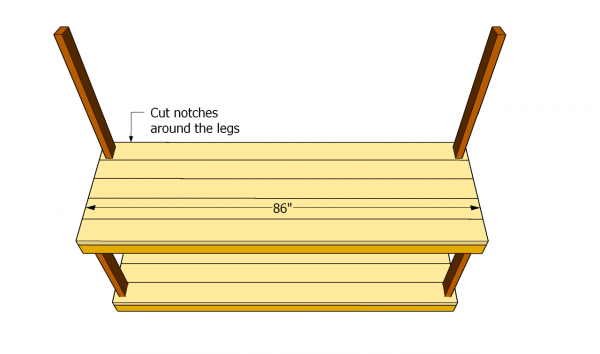 The first step of the project is to build the legs of the garden work bench. 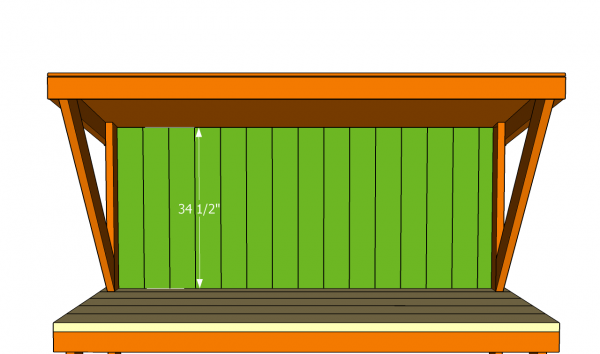 As you can easily notice in the image, you need to use 2×4 lumber to build these components. Adjust the size of the legs according to your needs. Cut one end of the back legs at 15º, as we will install a basic roof to protect the bench from bad weather or excessive sun. Smooth the cuts edges with a sanding block. Next build two frames for the shelves, from 2×4 lumber. As you can see in the image, you need to drill pilot holes trough the perimeter components and secure the rest of the wooden parts with 3” wood screws. Attach the frames to the legs and lock them into place with 3” wood screws. Leave about 2” from the ground to the bottom shelf. Plumb the legs with a spirit level, if you want to get a professional result. 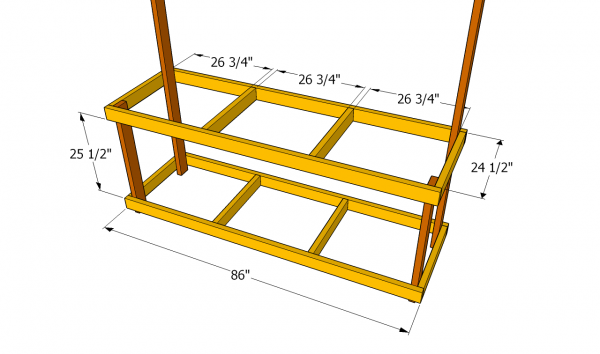 Continue the woodworking project by fitting 2×6 slats on top of the frames. In order to build sturdy shelves, we recommend you to secure the slats into place with 2 1/2” screws. Don’t forget to countersink the head of the screws, if you want to get a professional result. Top Tip: Make sure you align the slats at both ends and you don’t leave any gaps between them, before inserting the wood screws. 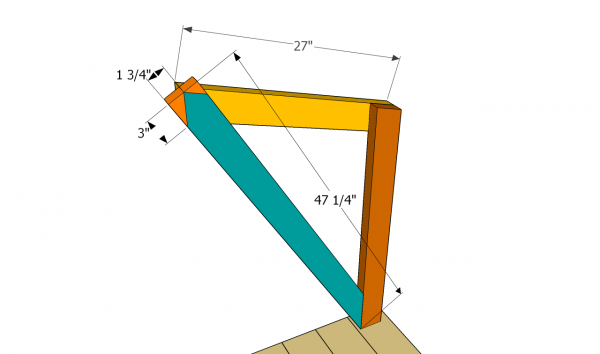 In order to build the roof of the work bench, we need to attach the braces, as in the free plans. Building the roof will protect the plants and the tools from sun and bad weather. 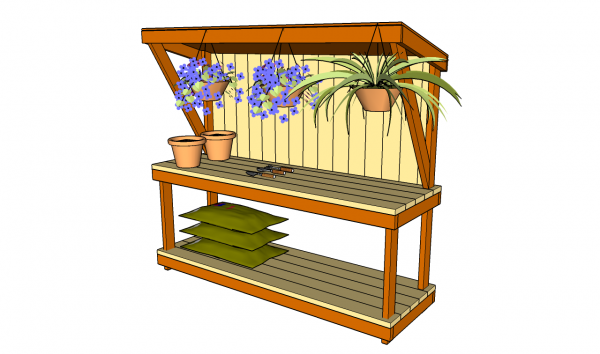 Check out these potting bench plans, if you are looking for a more simple project. Secure the components into place with wood screws, after drilling pilot holes. Align everything with attention. Cut a small piece of 1/2” plywood and attach it on top of the rafters. Align the piece of plywood at both ends, making sure it is flush with the rafters. Drive in 2” galvanized screws trough the plywood into the roofing components. If you want to protect the roof from decay or water damage, in case you place the garden bench outside, you should cover it with roofing felt and asphalt shingles. 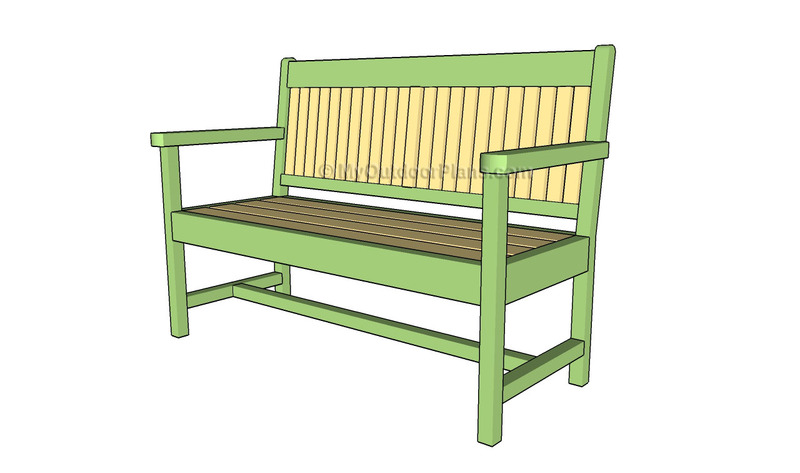 Attach 1×4 trims to front and back faces of the bench, in order to give it a nice appearance. Secure them into place with 1 1/4” finishing nails. In addition, you could also add slats to the back of the work bench, if you want to increase the rigidity of the construction. 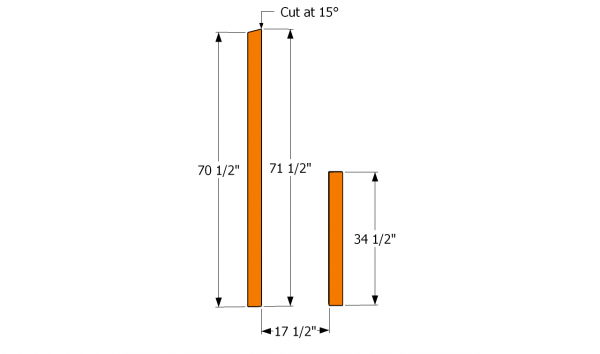 Secure the slats to the roof trim and to a 1×4 brace installed at the bottom of the slats. Pre-drill the slats and insert 1 1/2” screws trough the slats. Last but not least, you should take care of the finishing touches. Therefore, fill the holes with a good wood filler and let it to dry out properly, before sanding the surface along the wood grain using 120-grit sandpaper. 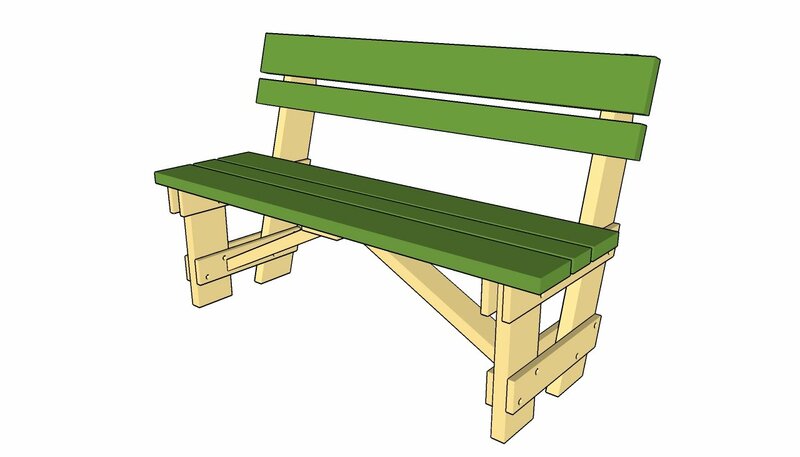 Top Tip: Protect the garden bench by applying several coats of primer and paint over the wooden components. Cover the roof with asphalt shingles, if you want further protection against rot. This article was about garden work bench plans. If you want to see more outdoor plans, we recommend you to check out the rest of our projects.